It’s hard to imagine the Portland Winterhawks having a better season than the one they had in 2012-2013. They finished the WHL regular season with a league best 57-12-1-2 record and a third straight trip to the finals. They beat the defending champion Edmonton Oil Kings and moved on to the Memorial Cup, where they came up one game short of a perfect season. Getting to the top and staying there is a hard thing to do in junior hockey – team success usually means great players moving on. Surely this is the year that Portland comes back to earth, right? The Winterhawks were a machine last year. They had the league’s best record, scored a league best 334 goals, were second in goals allowed, had a top line that finished in the top three in scoring and tore through the playoffs with a 16-5 run. In June they saw four of their draft eligible players get selected in the NHL Draft, highlighted by Seth Jones going fourth overall. How can they possibly repeat? They are looking at losing top players like Ty Rattie and his 48 goals. They lost their captain Troy Rutkowski who picked up 66 points from the blue line. They lost Calgary Flames draft pick Tyler Wotherspoon who was +62 on the year. Clearly they have no chance this year. The problem with that logic is twofold. For starters, the cupboard is far from bare in the Rose City as they still have several elite players. Secondly, settling for rebuilding is not the atmosphere the Portland Winterhawks and head coach/general manager Mike Johnston has established. For them, making a run for the finals is the expectation. It’s quite a veteran group coming back. Portland returns two thirds of the league’s best line. Brendan Leipsic and Nic Petan are back, and while they’ve lost Rattie, Johnston says there are plenty of players who could step up and join the top line. That includes guys like Oliver Bjorkstrand (31 g, 32a) as well as younger players Keegan Iverson or Presten Kopek. While that line won’t combine for 143 goals again it will still be dangerous. As will the rest of the club. Two key players who should step up for Portland this year are Taylor Leier (27g 25a) and Chace De Leo (18g 38a). Both players were not as hyped as Portland’s big guns, but they are solid players who play at both ends of the ice and have a scoring touch. They had good playoff runs for the Winterhawks and will be asked to take on bigger roles this year. Portland will still score but will they be able to stop their opponents from scoring as much this year. They took some big losses at the blue line due to graduation and will have to have some new players stepping up. For Johnston, how the defense comes together will be key for the Winterhawks. Returning players Derrick Pouliot (Pittsburgh’s 2012 first round pick) and Josh Hanson will be asked to be the anchors for Portland’s defense this year. They’ve also added 20-year-old Garrett Haar from the Medicine Hat Tigers to add some depth. The other question mark is whether goaltender Brendan Burke is ready to step up and fill the big crease left behind by the departing Mac Carruth. Burke appeared in 33 games last year for Portland and posted a 2.65 goals against average and .908 save percentage. He put up those numbers behind a much deeper and experienced defense and will have to step it up while the new blueliners get their bearings. Johnston thinks his 18-year-old goalie is ready to take the number one mantle. How well he steps up may be key for the Portland Winterhawks and their quest for a fourth straight trip to the WHL Finals. While they may not be as dominant as they were last year the rumors of their demise are grossly over-rated. They still have an experienced forward group that is fast and will score a ton of goals and should be one of the top offensive clubs in the league. They’re defense is inexperienced and their goaltender is not as tested as they are used to having – how well they do may just determine the team’s fate. 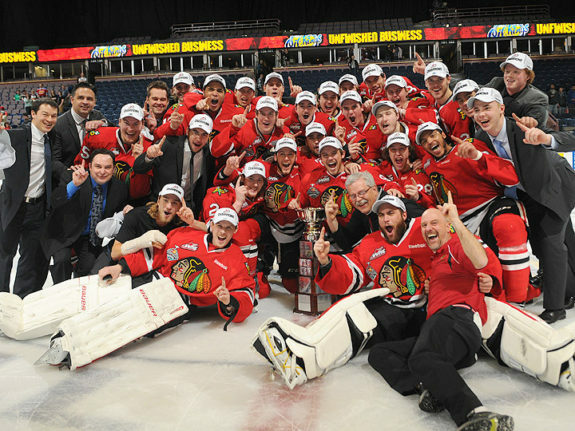 The Winterhawks really did not have to worry about any conference or divisional races last year as they ran away with things. It won’t come as easy for them this year but they are still the best team in the U.S. Division and should end up on top again. As for the conference race they will have some competition from the Kelowna Rockets who might push them for the West’s top spot. Look for the Winterhawks to be neck and neck with the Rockets as both teams seem headed to what would be a fun playoff showdown.